It is important to optimize your environment for photo editing. Select preferences from the edit menu and you will see there are several options. The first thing to look at is how Photoshop allocates memory. Default setting should be 70%. You can allocate more if you are prepared to close down other programs you may have open on your computer whilst you are editing. You can also optimize memory by specifying the history states and cacheTemporary storage. An area of the hard drive where information is stored about the thumbnails metadata and ranking information in your images. levels BUT you should only alter these if you find screen redraws are becoming very slow when you are editing. History states are the number of steps you can backtrack over whilst editing. Obviously the more steps you backtrack over the more memory is used. I would recommend a setting of 20 although you might reduce or increase this according to your needs once you actually get a feel for it whilst you are editing. Your computer also uses your hard disc as virtual memory. This is often called the scratch disk. You should check that it is not going to consume too much space, which slow your whole machine down. 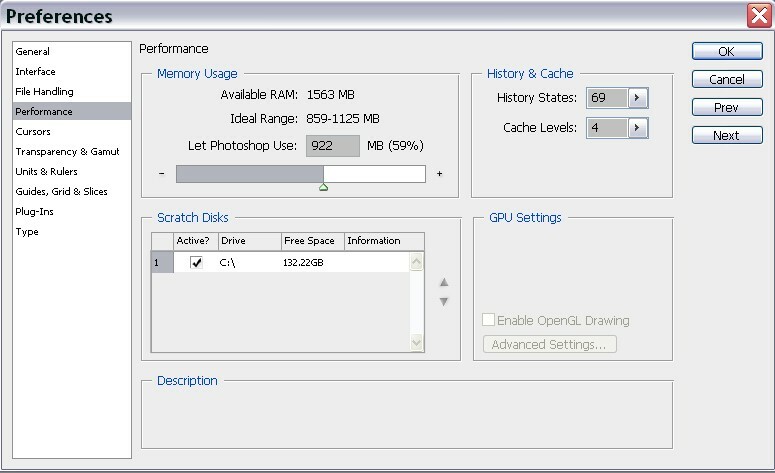 You can check how efficiently Photoshop is allocating memory whilst editing by clicking at the base of the image window and choosing 'Efficiency'.